Mull of Kintyre This picture is taken on the Mull, which is the most South Westerly part of the Kintyre peninsular. 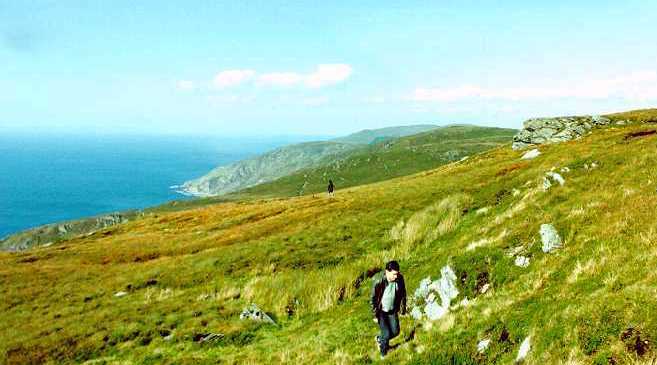 Before you ask, a Mull is a headland, and incidentally Kintyre comes from the Norse for a headland, so the Mull Of Kintyre is the headland at the end of the headland! This part of the Mull has been a bit of a plane's graveyard over the years and there are still airplane parts lying around which have been up there for more than 50 years. This is not far from where the MOD Chinook crashed in 1994, a story which rumbles on unresolved to this day. Computer Weekly magazine held a long-running campaign to have a detailed enquiry into the crash re-opened and continually challenged the original findings, that the pilots had been grossly negligent. Their most recent press article on this reflects the current state of play as well as providing links to some of the background. In 2001 I added a couple of pages on the tragic events that led to the demise of an RAF Neptune aircraft in 1956. Kintyre South coast This picture was taken by Wes Gainer, an American who was stationed at RAF Machrihanish, (you can see more of his pictures here). 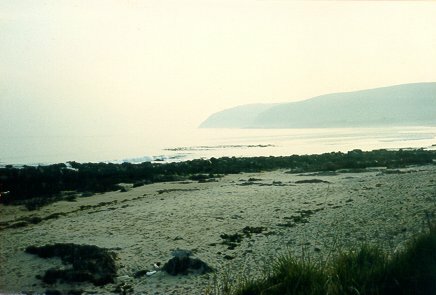 This is taken looking along the bottom of the Kintyre peninsula towards the West. On a clear day you can see Ireland behind the hills rising out of the sea. This area is known as Keil; Keil cemetery is just on the other side of the road from the beach, the remains of Keil School are further back along the road, and what is sadly becoming the remains of Keil Hotel slightly further back again. Just a few hundred yards along the road from this point are Keil (you could have guessed that) caves. This picture shows Dunaverty Rock, on top of which stood Dunaverty Castle, the scene of many a bloody encounter in the past. Robert The Bruce is said to have been given shelter here prior to his escape to Rathlin Island just off the Irish Coast (where he's supposed to have seen the spider). He was given shelter there by one Angus Og, a direct descendant of Somerled. The name Angus Og has been better known in more recent times as that of the Highland cartoon character who appeared regularly in the Daily Record, created by the late Ewan Bain. The remnants of the old castle can still be seen on top of the rock today. This picture was taken a few years ago and as such visitors today won't see it looking exactly like this. 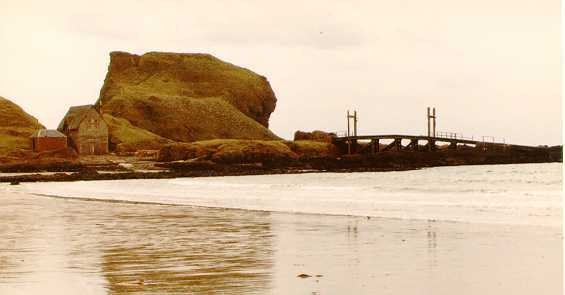 The construction running into the sea is the old lifeboat slipway, and the building at the foot of the rock on the left is the lifeboat shed. There isn't a lifeboat here any more, in fact there hasn't been one in my lifetime; the area is now served by the Campbeltown lifeboat. The name Dunaverty is also synonymous with the game of golf; Dunaverty Golf Course is only a few hundred yards from the point of this picture. It's an 18 hole, par 66 course, of 4799 yards length. To find out more about it visit this site, which has a number of pictures along with a score card and contact details. And if you're in the area don't forget to stop at the Muneroy tearoom in the village.